Have I told you lately how happy comments and shared experiences from readers make me feel? Well, they do. I work so hard to make these lesson accessible to all and it only takes one little comment to make me feel like I am really doing some good in the world. This adorable family shared a comment about Lesson #9 that made my heart sing. Noah to the boys in less than 30 seconds. Because no matter how the FHE turns out, the point is...you held FHE. Thank you SO MUCH for sharing, Deanna! I am starting to feel like I know you. A few more of these touching comments and I'll be splitting a Best Friends Necklace with you. 22 of you downloaded the lesson pdf. In return for providing you with free FHE plans, I request that you add comments on your Year of FHE experiences to encourage others. 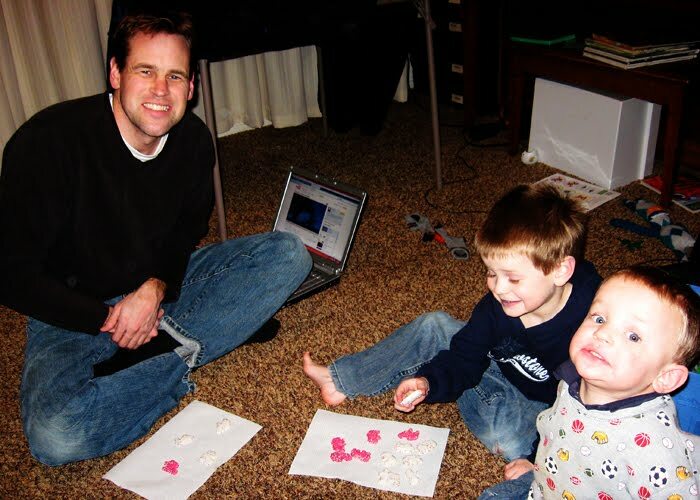 Feedback on lesson plans, photos of your family and stories from your FHE are so inspiring! See CONTACT button for email instructions. I agree...Anyone else wanna share? If 22 of you downloaded it, but thought it didn't go well, or it went FABULOUS, or you had bumps in the road like us (hey, if watching it on youtube counts as fhe, then almost anything will go, right?) then SHARE!!! We've been following along since day one and I've only popped over here a couple of times to share - I'll be better! The highlight of our FHE last night actually happened today. Instead of playing GI Joes or Star Wars after homework was done today, one of my sons insisted upon re-creating the Noah's Ark story with all the little cut outs. It made me feel good that the message was lasting beyond Monday night :). Confession...still have not had FHE yet for this week! I only just started having FHE last month, thanks to your AWESOME lessons, and am trying to get in the groove of it. My girls (3 and 1) and I are making the family photo books from the "Our Extended Family" lesson plan this week, though, and we're excited about it. Something I've always wanted to do, but never thought to make it so simple with the $1 spot photo books (awesome!). I'll try to come out of hiding to comment more! Cutest family ever! And I have absolutely no bias except that they're the best neighbors we've ever had! I always forget to get the camera out for FHE, but we're following along, too, and I love it! I've been a stalker for a while. (Thanks to Deanna...) and unlike her, taking pictures, I've just posted my first post about your wonderful lessons and website.